I have a confession to make. If there is one thing I enjoy more than reading, it is snuggling up in my bed and watching single handily the greatest television show of all time, Gilmore Girls. To be honest, I’ve lost count as to how many times I have watched this show from pilot to finale in its fifteen years of existence. I remember the first time I ever watched this show, I was 9-years-old and watched it religiously from the years 2000-2007 with my mom and my sister. To say this show hasn’t had a big impact on my life is an understatement. Firstly, for those of you who aren’t aware, and if you aren’t where on earth have you been for the past fifteen years, the show revolves around a mother-daughter duo, Lorelai and Rory Gilmore, who are eccentric, strong-willed, independent women ready to take on the world. In fact, even the supporting women, from Emily Gilmore to Sookie St. James, are represented in this way, which is probably why I love it so much. Girl power all the way. Second, both the protagonists have an unhealthy obsession with caffeine, something I can definitely relate to as a post-secondary student. To quote Lorelai, “I stop drinking the coffee, I stop doing the standing and walking and the words putting into sentence doing.” Yup, this quote sums up my entire existence in nineteen words. 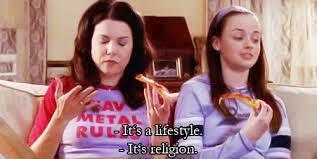 Thirdly, and probably the most important, Rory Gilmore, fictional as she may be, is a big inspiration for me. She is not afraid to be herself. She goes through trials and tribulations, same as any girl from the ages of 16 to 23. She is an aspiring foreign correspondent, with her greatest influence being the very real Christiane Amanpour (who does, in fact, make a cameo in the last episode of the series). However, the greatest reason as to why she is was, and still is, an inspiration to me is her love of reading. Throughout the show’s run, there were quite a few references to what Rory chose to read on a day to day basis. I remember watching the show a few years ago and frantically writing down every book mentioned in hopes of one day reading them. I suppose many fans had the same idea, and while perusing Pinterest I came across a master post of all the mentioned books called “The Rory Gilmore Reading Challenge.” Unfortunately, I cannot give credit to the originator of this challenge, as there doesn’t seem to be one set “creator” (perhaps I could accredit the challenge to the creator of the show, Amy Sherman-Palladino), but I thought it would be fun to go through the books on the list to see how “Rory Gilmore” I am.